Answer: St. Elmo’s Fire isn’t really “fire,” but it is a real, and well understood, electrical phenomenon. The answer to your question is not that complicated, and no equations are required, but there’s a fair amount of physics involved. I’ve observed a similar effect on the tips of lightning rods during electrical storms (from a safe distance through binoculars). It doesn’t appear as intense as the image above, but the principle is the same. Here’s what’s happening. When you pile enough electrons onto an object by whatever means, these negatively charged particles all repel each other with an electrostatic force. At some point, this repulsion will overwhelm the ability of air to act as an insulator, and the electrons start to “leak” into the air. The violet color is caused by the excitation of nitrogen molecules that make up 70% of our atmosphere. That’s why all sparks have this characteristic color. The tiny sparks that sometimes jump from your finger to a wall switch or doorknob, and large sparks like lightning bolts, differ in brightness but have the same color. Charge leakage is enhanced if the charged object has a sharp point. Electrons are more “crowded” at such a point and more strongly repel each other. Also, the small radius of curvature near a point creates a stronger electric field that more easily ionizes the air. And ions allow air, normally a strong insulator, to conduct electricity. On a lightning rod, or other electrically conducting pointy object, a corona discharge will form during certain atmospheric conditions. It’s easier to understand if we assume a positively charged cloud located above that object (as in the graphic). But it also works with negatively charged clouds, in which case electrons are just moving in the opposite direction. When that cloud is positioned over your house (or steeple or ship) electrons are attracted from all directions and stream through the earth or water, accumulating as a negative charge on your house (or steeple or ship). If that charge gets too large, a lightning bolt is Nature’s way of neutralizing it. Some bolts go from cloud to ground, others from ground to cloud. A common misconception is that lightning rods are designed to attract lightning. Not so — they’re designed to prevent it. The sharp tip forms a corona discharge, allowing electrons to be exchanged slowly (and safely) between the earth and sky. When a negative charge meets a positive charge, they neutralize each other. This is what prevents the unchecked charge buildup that would eventually result in a lightning strike. Of course, lightning rods are not 100% effective. If the charge buildup is too rapid, even a home protected by lightning rods can be hit. If that happens, the bolt will usually strike a lightning rod, which then channels most of the energy through a thick wire into the earth. This minimizes damage to the structure. So here’s where good St. Elmo (aka Erasmus of Formiae) comes in. He lived during the 3rd century AD, and became the patron saint of sailors. If a corona discharge forms on the mast of a ship, and starts neutralizing charges, that ship is less likely to be struck by lightning. In the 21st century, we understand why. In the 3rd century, the science of electricity was virtually nonexistent. But sailors did notice a correlation between the appearance of the eerie violet glow, and their ship not getting hit by lightning. 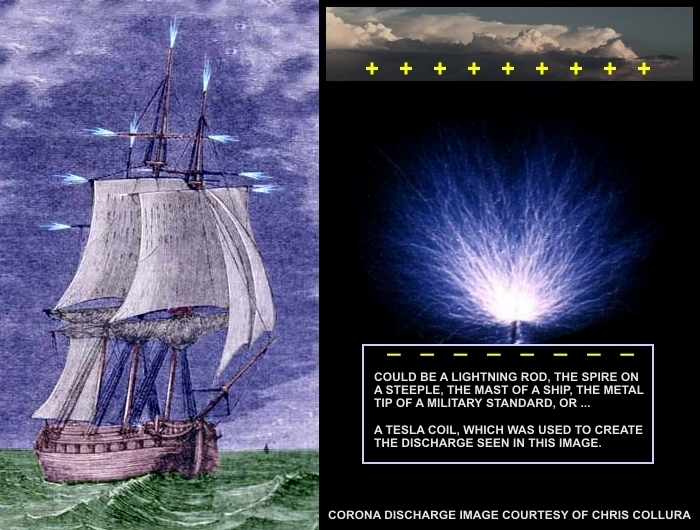 The corona discharge was interpreted to be a “sign” from St. Elmo that their ship was under his protection. Hence the term: St. Elmo’s Fire.